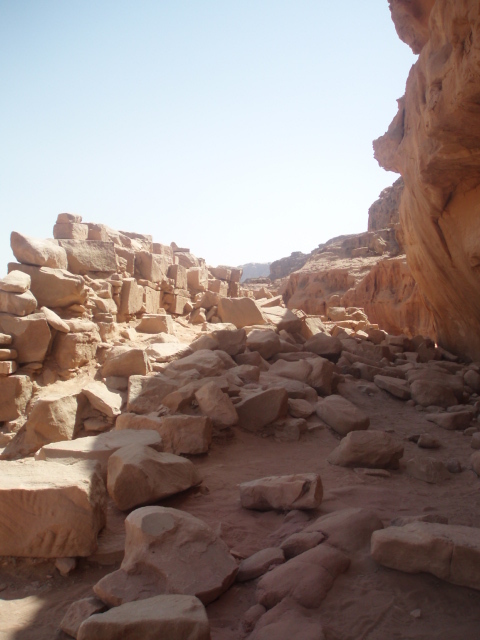 Last we spoke, David and I had just been to Petra By Night which was simply gorgeous. 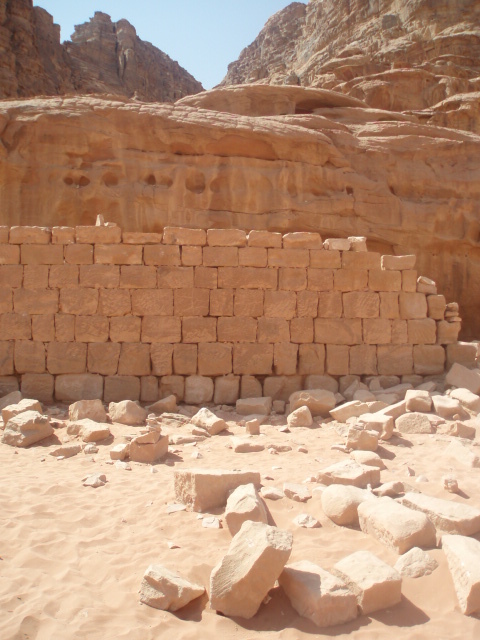 We had another full day left in Petra and so we organised a tour of Wadi Rum. A wadi is basically a desert valley and this one is vast and spectacular. It is inhabited by the Bedouin and their tents can frequently be seen off in the distance. We spent several hours cruising around the dunes courtesy of Abdullah, our tour guide and 4WD driver. When the sun started burning the back of my neck Abdullah was kind enough to show me how to tie my sarong around my head in traditional Arabic style. I loved this SO much, I didn’t want to take it off, even after the sun went down. Thanks Abdullah, you’re cool! Wadi Rum is where they filmed the ‘Egypt’ scenes in the recent movie Transformers: Revenge Of The Fallen (for those of you who noticed the scenery – and I’m not talking about Megan Fox). It is also where T.E. Lawrence (otherwise known as Lawrence of Arabia – you might have heard of him) spent a few years. Below are a couple of pictures of his ‘house’. It doesn’t look like much but by desert standards it’s a veritable palace!! The next day we were off again to check out the Dead Sea. We splurged on these three days and stayed in the Marriott hotel which seemed happy to ignore Ramadan so for the next three days it was freeflowing booze and food during the day. We made several trips down to the hotel’s private beach on the Dead Sea. Now, everyone knows the Dead Sea is salty and that you can’t sink. That’s like me telling you that tearing the ligaments in your knee hurts. Of course you ‘know’ that, but until you experience it for yourself you have Absolutely No Idea. The Dead Sea is AMAZING!! Probably my all time favourite travel experience ever. First of all, it is a gorgeous deep blue colour, like the Mediterranean Sea. Looking at it closely though, it appears to have an oiliness to it, best described as being like a lake of warm baby oil. And upon entering, that’s exactly what it feels like. Your skin gets coated in the oiliness (which I suppose is due to the minerals – there are 26 of them floating around the sea apparently). And when you come out you look like a penguin that got too close to the Exxon-Valdez. But it feels beautiful and it truly softens your skin. Another skin softening element of the Dead Sea is the mud. Yep, mud. The Sea produces a very fine silt mud which people are wont to spread over their hair and bodies, let dry in the sun and then wash it off in the Sea. It’s messy but amazing fun. Yes, the shore did look a bit like an episode of The Twilight Zone with a dozen tourists looking like Creatures From the Black Lagoon but apparently the healing qualities of the Dead Sea are so well recognised that many German health insurance companies offer rebates on stays of two weeks or more. In a five star resort no less. You’ve gotta love the Germans. The other thing we noticed immediately after entering the water is the intense and persistent stinging felt in our feet, courtesy of our Petra blisters. Oweeeee!! Now, the Dead Sea is a crazy body of water for many reasons but one of them is that at the northern end (where we were) it’s depth has been measured as 430 metres. That is friggin’ deep!! So when we swam out about 5 metres from shore, the depth was already 20 metres. Which, for me, would normally be very scary. There were two reasons why I wasn’t frightened at all. One: you simply cannot sink, so if you just lay on your back there is no danger of drowning. Two: The reason I usually get scared in deep water is all the freaky creatures that usually live down there. This is not an issue in the Dead Sea as the water is so saline that absolutely no life can survive in it. Yay for me!! So there we were bobbing about and having a fun time when we decided to see if we could dive underneath the water and get completely submerged. David did it first and, to credit to his swimming prowess, managed to go completely under the water before quickly being thrown back up like a cork. Of course as soon as he opened his eyes, the salty water started stinging them and the ‘ow-ow-ow’s’ started. Which goes no way towards explaining why two minutes later (after I’d got my laughter under control) I decided to dive down as well. So down I go. Or rather, down I TRY to go. It’s actually really hard. I think I got my head and upper body about two feet under water before being spat back out. I, however, had the presence of mind to not open my eyes straight away. I kept them closed for about two minutes and right about the time David’s ‘ow-ow-ow’s’ subsided, I thought that it would be safe to look. So I opened my eyes and basically took up the ‘ow-ow-ow’s’ where he left off. My eyes are watering just thinking about it now. It didn’t really hurt as such, but it does sting a lot and for a long time. Now you may ask, out of curiosity, why I went under knowing that it would sting after seeing David’s discomfort. The answer is that even though I knew it wouldn’t be pleasant I still wanted to experience it for myself. Good reason, huh? I highly recommend it. I’d even go so far as to say go to Petra first, get the damn blisters and then cannonball into the Dead Sea. It’s the only way to go. After our Jordan trip we only had 8 days back home before we jetted off to the Spanish island of Ibiza for three weeks. A lot of people associate Ibiza with raves and Brits getting off their heads but honestly that is such a small element of the island and if you are not seeking it out you can remain blissfully unaware of it. It’s a gorgeous Mediterranean paradise with spectacular beaches, yummy tapas, refreshing Sangria and friendly locals. Oh, and if you’re expecting an Ibiza ejo, you’ll be disappointed. What happens on Ibiza, stays on Ibiza (wink wink). Unfortunately for us, we are now desperately in debt from all the global gallivanting we’ve been doing and have to stay put for a while. So expect more Dubai based ejo’s in the future. That’s all for now. I hope you are all well. I am particularly well because I heard about fifteen minutes ago that the interview I had last week for a job at Al Maktoum International Airport (due to open June next year) was successful. So I will once again be a working Air Traffic Controller. I’ve had an awesome year off, focussing on my writing and honing my skills of sloth, but now it’s time to get back to work. The simulator training starts in a month. Crack open the black market Champagne and wish me luck! !